Before anyone took a knee on a football field, two athletes from San Jose State University (SJSU) raised their fists in the air. It was 50 years ago this week. It’s one of the most iconic images in sports history: Tommie Smith and John Carlos, two African-American track and field medal winners from SJSU, standing shoeless on an awards platform in Mexico City with their heads bowed and their fists in the air. 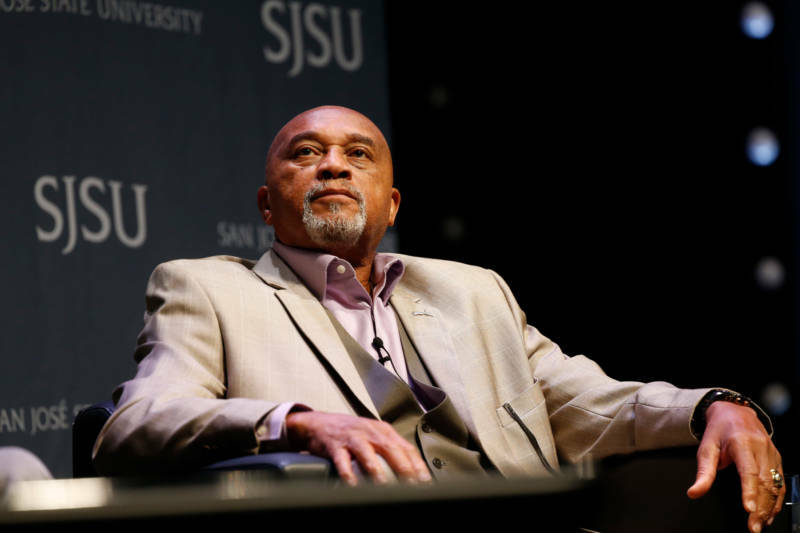 This week, San Jose State University celebrated the major anniversary of that moment with a town hall that drew a large, enthusiastic crowd of students and a few people old enough to remember the original moment. His hair now grey, 74-year-old Smith has no regrets. "Find something to be responsible for. Get up in the morning, look in the mirror, and say to yourself, you have a responsibility. Then you've got to answer that. What is it?" As a young university student, Smith was thinking along these lines before he qualified for the 1968 Olympics in Mexico City. 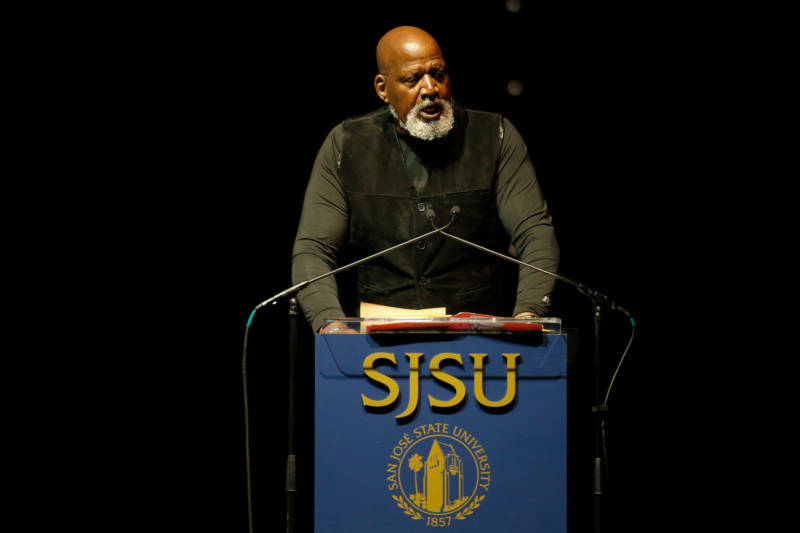 In 1967, as the Mexico City Olympics approached, another athlete and activist on campus by the name of Harry Edwards formed the Olympic Project for Human Rights. The group called for an athlete boycott of the games, to highlight the inequities African-American athletes faced. They wanted more black coaches. They wanted Olympic officials to restore Muhammad Ali’s heavyweight title, to disinvite South Africa and Rhodesia (now Zimbabwe) from the Olympics, and to remove Avery Brundage, the controversial International Olympic Committee president, from power. The boycott failed to gain traction, but in the political moment of 1968, after two major assassinations, rolling riots and protests throughout the country, Smith and Carlos were not alone in feeling the charged political atmosphere back home demanded some kind of response, some action to capitalize on the platform they would enjoy with the world's attention on them for the games. A number of athletes wore black items of clothing during the Olympics as silent, subtle protests, but Smith and Carlos had something bigger in mind. 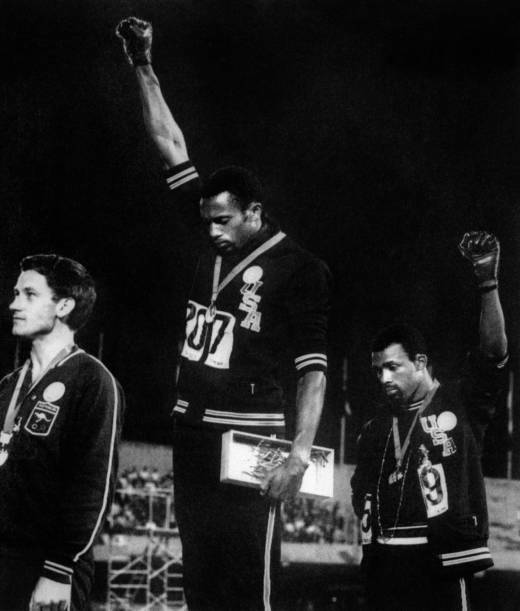 After they won the gold and bronze, respectively, for their performances in the 200-meter dash, they walked up to receive their medals wearing black scarves to symbolize lynching, as well as black socks with no shoes to symbolize poverty. As the crowd cheered, they each raised a gloved fist to the sky. Watch the men's 200-meter race at the 1968 Mexico City Games, and the awards ceremony that follows. The relevant action begins at 29:45. “The action … was an insult to the Mexican hosts and a disgrace to the United States,” Avery Brundage, the International Olympic Committee president, wrote in a letter months later. The superstars from “Speed City,” as San Jose State was called at the time, were banned from international track and field competitions. In 1968, Tommie Smith was one of the fastest men on the planet. He set 13 world records, including the one on Oct. 16, 1968. Over the years, attitudes towards what the men did began to change. In 1984, Smith and Carlos became emissaries for the Summer Olympics in Los Angeles. They were inducted into the U.S. Track and Field Hall of Fame. 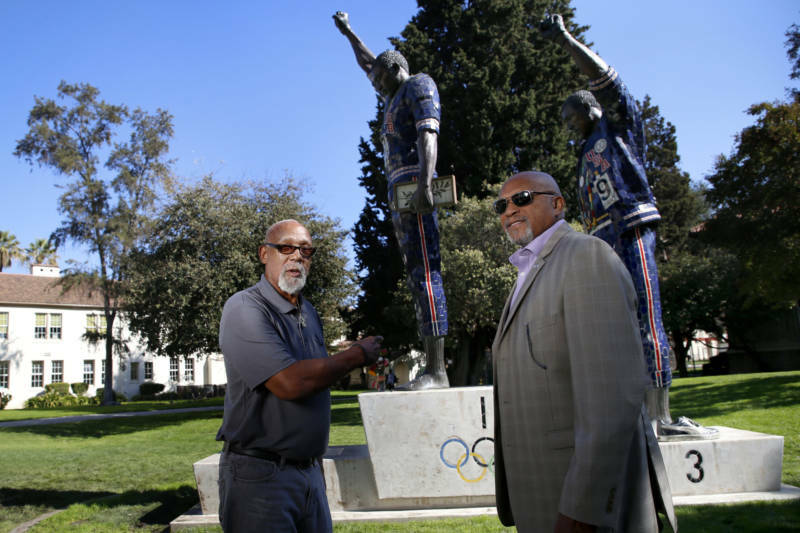 And in 2005, the Associated Students of San Jose State University unveiled, in the heart of the campus, a 23-foot-tall sculpture of the two athletes. Carlos told the gathering, "We had to do something that would be prestigious, respectable, pungent, shocking. We didn't give the finger. We didn't wrap the flag around our head or tie it up like a diaper. We didn't stand there with disrespect. We stood there to say, 'Hey man, I'm America. I'm your son and I'm wounded. I'm not wounded for me, because I'm one of your heroes. I'm in the Olympics. But I'm wounded for the race.' [...] That's why we went to Mexico City." He added, "I didn’t choose to be the guy in Mexico City. God chose me to be there. But God left it up to us as to how we were going to respond when we got there. " Also in attendance that day: Australian Olympian Peter Norman, the white, silver medal winner who stood with Smith and Carlos in sympathy back in 1968. Just a year before he died in 2006, Norman had this to say. "Two men made a statement that reverberated around the world. It was like a pebble into the middle of a small pond. The reverberations of the ripple are still rippling. It's a very big pond. It's the entire world." Edwards calls what happened in Mexico City part of the third wave of athletic political activism. The first wave, he explains, includes people like Jack Johnson and Joe Lewis who established the fact of black athletic talent. The second wave includes people like Jackie Robinson and Bill Willis who struggled to establish access to the fields of play, to end segregation of professional sports after World War II. The third wave includes Muhammed Ali, as well as Smith and Carlos. "Dignity and respect. Not only did they want to be on the field and on the courts, in the boxing ring. They wanted to be respected as human beings outside of the arena. That’s why it was the Olympic project for human rights, not the Olympic project for civil rights," Edwards says. Colin Kaepernick, the quarterback who lost his NFL position after kneeling during the national anthem to protest racial and social injustice? Edwards says Kaepernick is part of the fourth wave, which he sees as play for power. "Today, we're in a position where we can exercise power. Here's what we want to talk about." Edwards sees a fifth wave coming: women claiming more of a leadership role in professional sports. "We're not going anywhere where women don't lead," he says.